Panasonic P2 series camcorders are widely used by some professional cameramen. It can bring users vivid HD picture. If you are one of the P2 users, you may get in trouble for dealing with the recorded footage. The memory card of Panasonic P2 stores the footage in MXF format. This video format is designed to streamline workflows between different platforms, such as cameras, digital editing equipment, and servers. And the MXF format is only supported by some specific video editors or media players (not including QuickTime). 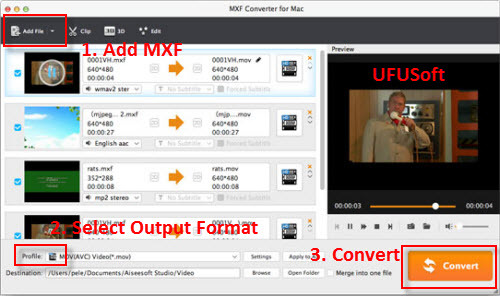 As we know, MXF format is mainly for HD recording, but not good for editing or playback, on Mac and Windows platform, there is no editing software or player that support Panasonic P2 MXF file directly, in this case, you may need a Panasonic P2 MXF video converter to transcode MXF video files to compatible format for editing software or players, here we recommend you to try our UFUSoft MXF Video Converter for Mac or Windows, this software is perfect tool to convert Panasonic MXF and other formats to any formats you need, such as MKV, AVI, QuickTime MOV, or Apple ProRes 422/4444 codec for FCP editing on Mac, there are many formats have been optimized for editing software and portable devices. How to use this Panasonic P2 MXF video converter? 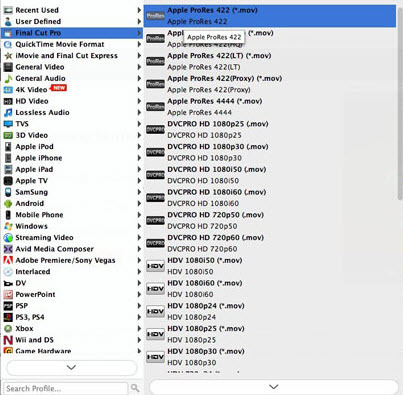 Here is an example to convert Panasonic P2 MXF to QuickTime MOV, Apple ProRes 422/4444, if you need to convert to other formats, the steps are the same. What’s the best way to turn Panasonic P2 MXF videos into playable format like QuickTime MOV, Apple ProRes 422/4444? Once launched the program, click “Add Video” button to load your source Panasonic P2 MXF clips. You are allowed to add multiple files to convert at a time. Step 2. Select QuickTime (*.mov) or Apple ProRes 422/4444 (*.mov) as output format. Click on the dropdown menu of “Format” and select QuickTime mov or Apple ProRes 422/4444 mov as target format. If the default A/V settings can not fit your needs, you can click “Settings” button to custom the output video and audio settings by yourself. But if you are not good at it, you’d better use the default parameters, they will ensure you a good balance between file size and image quality basically. Step 4. Click convert button to start the Panasonic P2 MXF to QuickTime MOV or Apple ProRes 422/4444 conversion. With the P2 MXF to QuickTime/Apple ProRes 422/4444 converter, you can easily convert P2 MXF to QuickTime MOV or Apple ProRes 422/4444 format, and then you can use MXF files as you want.